We would like you all to meet our new associate Dr. Kristen Miller! Here she is posing with our own “grumpy cat” Gary. 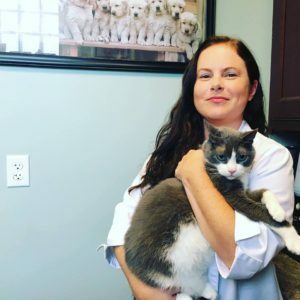 Dr. Miller sees all pets, but specializes in feline medicine and exotics (rabbits, chinchillas and guinea pigs), and is known as our “cat whisperer”. She is also certified in veterinary acupuncture from the Chi Institute. Dr. Miller believes in minimal vaccine protocols, natural and raw diets for pets and essential oil therapy to keep pets in the best health possible. She uses traditional medications and surgery when necessary, but prefers to take a natural approach. She is Certified to perform acupuncture on dogs and cats as well as rabbits, chinchillas and guinea pigs. She will be be available during the week including every Wednesday and on Sundays starting November 5th. Our staff is very excited to have her on board! Check out our “About Us” page to learn more about Dr. Miller. Call us to make an appointment with Dr. Miller today! This entry was posted in Uncategorized and tagged cat acupuncture, cat vet, dog acupuncture, holistic vet, rabbit acupuncture, rabbit vet, veterinary acupuncturist. Bookmark the permalink.